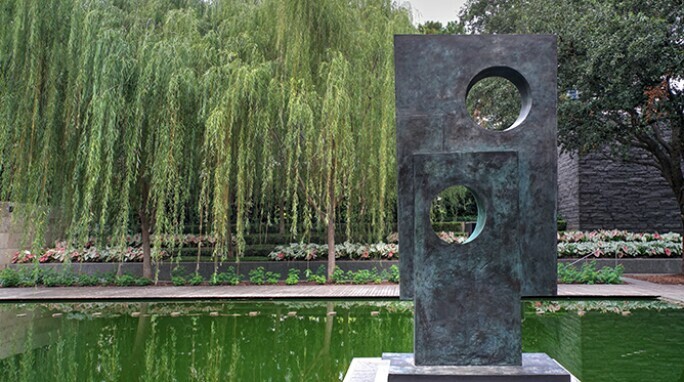 United States - The 19th-century American novelist Nathaniel Hawthorne said: “Moonlight is sculpture; sunlight is painting.” For something less ephemeral, sculpture parks offer some of the most thought-provoking settings to experience monumental works en plein air – in sunlight or in moonlight. 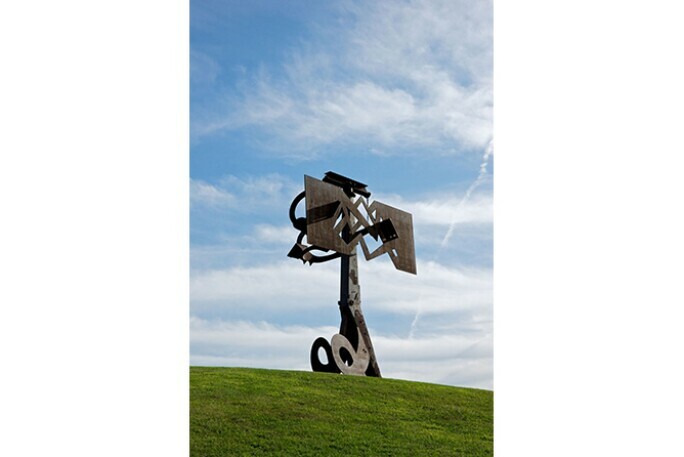 MARK DI SUVERO, FROG LEGS, 2002. LENT BY THE ARTIST AND SPACETIME, C.C., NEW YORK TO STROM KING ART CENTER. © JERRY L. THOMPSON. The United States boasts many of the greatest outdoor museums and with summer still in full swing, there’s no better time to explore these urban and wild oases. Why not consider a trip to these remarkable sites? DAVID SMITH, 2 CIRCLES 2 CROWS, 1965. IRMA AND NORMAN BRAMAN ART FOUNDATION, FLORIDA. STORM KING ART CENTER. 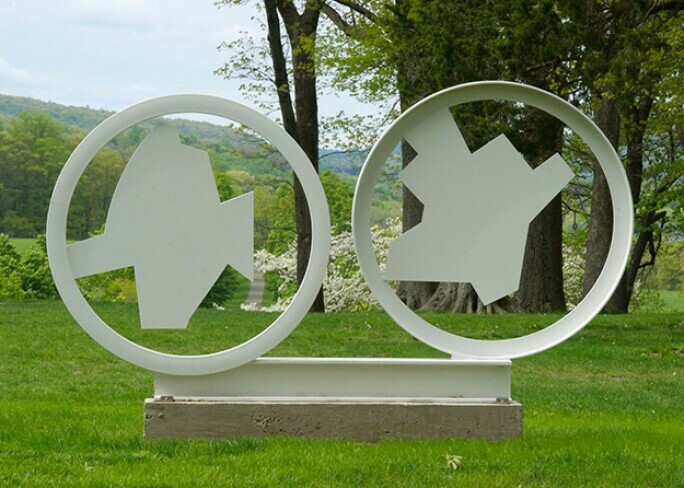 An hour north of New York City, the Storm King Art Center is an outdoor museum installed over 500 rolling acres of fields, hills and woodlands in the Hudson River Valley. Initially built as a place to exhibit the work of the Hudson River School, the centre opened to the public in 1960 and is now considered one of the world’s leading sculpture collections. On permanent view are a mix of works from the collection and long-term loans by artists including Joel Shapiro, Lynda Benglis, Mark di Suvero, Anthony Caro and Louise Nevelson. They are complemented by temporary exhibitions. David Smith: The White Sculptures is currently on view until 12 November. ISAMU NOGUCHI, CORE, 1978. COLLECTION OF THE ISAMU NOGUCHI FOUNDATION AND GARDEN MUSEUM, NEW YORK. PHOTO BY NICHOLAS KNIGHT. © THE ISAMU NOGUCHI FOUNDATION AND GARDEN MUSEUM, NEW YORK / ARTIST RIGHTS SOCIETY [ARS]. The Japanese-American sculptor Isamu Noguchi originally bought this 1920s brick factory overlooking the East River in Queens to convert it into a studio and warehouse. In 1985, three years before the artist died, he opened the space to the public as a museum and sculpture garden. Conceived as an outdoor space that incorporated the interior galleries rather than the other way round, the garden is reminiscent of a traditional Japanese garden and a work of art in itself. 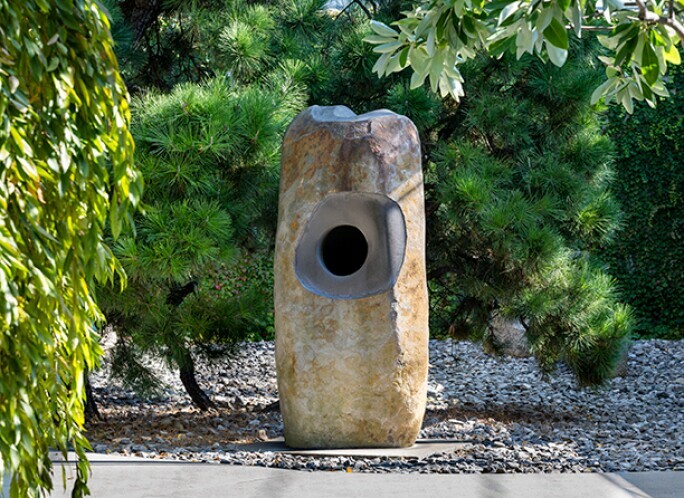 As well as being a prolific sculptor in basalt and granite, Noguchi successfully turned his hand to stage and furniture design, and landscape architecture. ROY LICHTENSTEIN, HOUSE I, 1998. NATIONAL GALLERY OF ART SCULPTURE GARDEN. GIFT OF THE MORRIS AND GWENDOLYN CAFRITZ FOUNDATION. © NATIONAL GALLERY OF ART, WASHINGTON. Among the works installed in the sculpture garden at the National Gallery of Art in Washington, DC, are Marc Chagall’s Orphée, 1969, a moving, delicate mosaic created for local patrons Evelyn and John Nef referring to the artist’s experience of being smuggled out of Nazi-occupied France. Louise Bourgeois’s Spider, 1996, is also on show. It is part of the artist’s famous series associated with her mother, who died when Bourgeois was just 21. 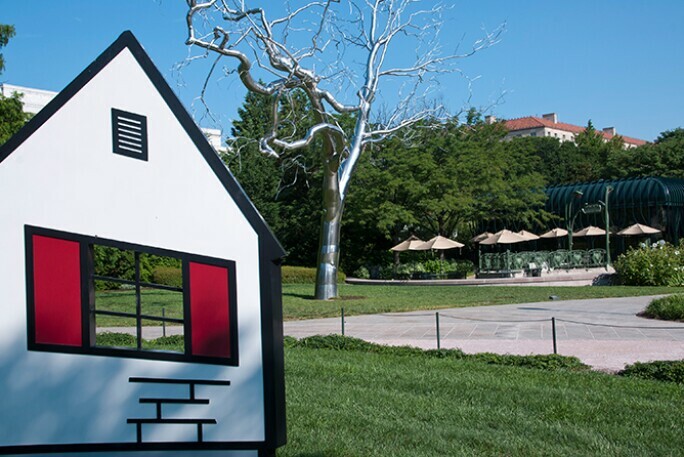 Other well-known works include Roy Lichtenstein’s House I, 1996–1998, which plays with perspective to produce a dazzling illusion of movement. In a prime location on the National Mall, the garden itself is thing of beauty, with native American species of canopy trees, flowering shrubs and perennials planted around a central fountain. BARBARA HEPWORTH, SQUARES WITH TWO CIRCLES (MONOLITH), 1963 (CAST 1964). RAYMOND AND PATSY NASHER COLLECTION, NASHER SCULPTURE CENTER, DALLAS, TEXAS. © CAROLYN BROWN FOR THE NASHER SCULPTURE CENTER. Stretching a full city block in downtown Dallas, the Nasher Sculpture Center is home to the Raymond and Patsy Nasher Collection, one of the finest groups of sculpture in private hands and boasting 300 works by some of the most important artists of the 20th and 21st centuries. True to Raymond Nasher’s vision for a “museum without a roof”, exhibitions seamlessly move between the 55,000 sq. ft. building, designed by the great Italian architect Renzo Piano, and the 1.4-acre sculpture garden, created by the world-famous landscape architect Peter Walker. Visitors can stroll among sculptures by Alberto Giacometti, Barbara Hepworth, August Rodin and Richard Serra dotted in and around groves of trees, miniature meadows and ornamental ponds. ROBERT SMITHSON, SPIRAL JETTY, 1970. DIA FOUNDATION. © NATHAN ALLRED / ALAMY STOCK PHOTO. 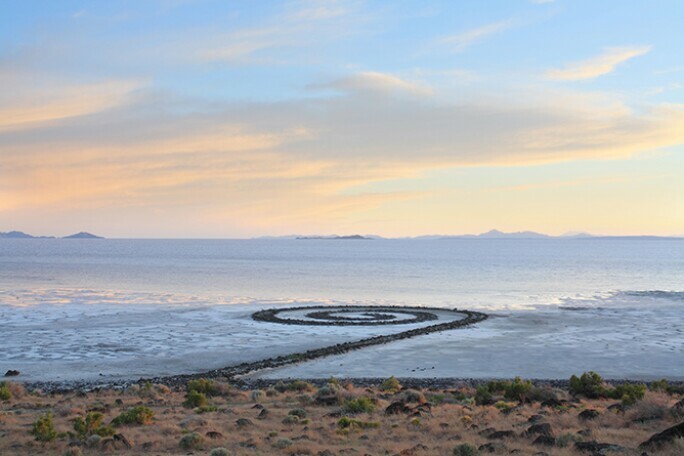 Robert Smithson’s monumental land art work, Spiral Jetty, is off the beaten track, but is well worth the pilgrimage to the Great Salt Lake in Utah. The 1,500 ft-long sculpture was constructed out of black basalt rock during a drought in 1970, and was subsequently submerged for more than three decades before re-emerging in 2004. The lake is currently facing the most severe drought in its history, igniting debate about how best to preserve Spiral Jetty. Smithson died in a plane crash in 1973 aged 35 and the work was donated to the Dia Art Foundation in New York in 1999, which also runs Dia:Beacon in upstate New York. Earlier this year, the sculpture was named an official state work of art by Utah.